A splotched cookbook is always the sign of a good one. A tomato-stained, water-warped, onion-scented cookbook means it’s more than just a reference for the shelf. And when you find the pages of such a cookbook caked together after your very first tango in the kitchen with itâ€”well, then, you know you have a winner. 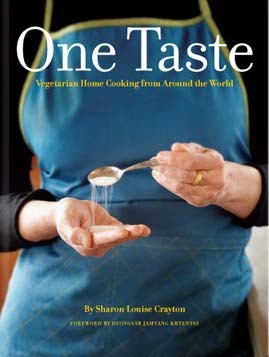 This is exactly what happened with me after opening Sharon Louise Crayton’s new book, One Taste: Vegetarian Home Cooking From Around the World. The folks at Provecho Press in Santa Fe recently sent me a review copy, and upon first flip through the book, I spotted a recipe I knew would win my husband’s heart (gut): Bhutanese cottage cheese with chile. We are cheese- and chile-loving folk, you know. But first, a little background on the book. The 108 featured recipes stem from Crayton’s travels around the world, into kitchens and homes, where she asked families their favorite foods to eat. Crayton, a Buddhist, writes from the premise that cooks need not only fresh ingredients, but fresh minds to make great meals. Meditations are sprinkled throughout the book. Recipes include a “Mind Refresher,” central to the cooking method of each dish. (I really like the Mind Refresher for fried eggplant with lemon wedges: “Appreciate whatever is happening.”) The introduction is written by Dzongsar Jamyang Khyentse, head of the Dzongsar Monastery, College and retreat centers in India and Bhutan. So last week, after a particularly hectic day, I opened the fridge and assembled a slightly altered version of the cottage cheese recipe (due to ingredients on hand). It turned out pretty darned good. I continued on to the roasted red pepper and garlic hummus (also pretty darned good), and the spicy soy-sauced tomatoes (ditto). It was but my first encounter with these recipes, but I could see I was going to love the book. I only wish I had more time to explore it before we leave the country soon. I must take the Buddhist approach and “appreciate whatever is happening.” I shall return to the book when we return to our kitchen. Now, go get yourself a copy of this book.